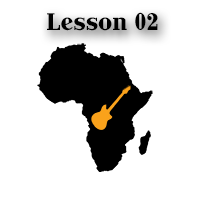 Here’s the 2nd polyrhythmic lesson of African guitar playing. In this one, there’s a single note bass line playing the root notes. The melody is on top, so the two form simple intervals together. Otherwise, it’s still a two over three fingerstyle example, just like the previous lesson. While it sounds simple and plays quite easy, there are of course the tricky parts (as usual). The first one is to keep both the bass and the melody lines steady, despite the string changes. What I mean is, in the 2nd part of the piece, the bass line changes strings back and forth, but the melody notes remain steadily on the same string (and same fret). It’s a usual mistake to follow the thumb with the picking fingers accidentally, at least in the first couple of play-throughs. It’s of course natural, so just be patient, and slow it down as much as you need to. The second “obstacle” is to get the hammer-ons right. You need to execute them strong enough with the fretting fingers, and also manage to stay in time. If you think that’s all there is to it, you are right. Don’t forget to get the TAB, and have fun! your music videos are superb ! Tinder wet, I just found your Videos on you tube. I know little about music but I chose your polyrhythm patterns over others. 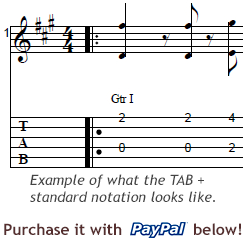 so please, I hope I would get my order the way in the tutorial lessons [videos and tabs]. Dear Alier, thank you for your purchase! I hope you’ll find the tablatures useful.